I have got to hand it to Shen who has done an amazing job on Twitter that piqued my curiosity so much that it was one of the first items that I penned down on my To-Do list even before I got back to Singapore. With modern technology, reservation was done via Twitter. I swear the human race is getting lazier and lazier. Dialing and speaking to make dinner reservation is just too much labour these days. iShame. Parking is very easy as there is a open-space public car park right in front. Do make sure that you have parking coupons as the place has not upgraded to IU-gantry type. There used to be valet parking but it was nowhere to be seen these days. See what I tell you about people getting lazier? iShame II. It was a party of 3 that evening and we ordered 3 dishes to share. I picked the Rendang Pizza, Jas picked the Bak Chor Mee Pasta and Travis ordered the Bak Kwa Ribs which was later changed to The Desiree Pizza. If you think this dish is going to taste like Bak Chor Mee at your local hawker centre, you are going to be sorely disappointed. 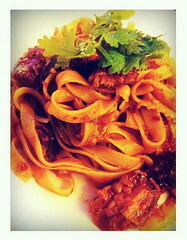 Think about it, if you want the regular Bak Chor Mee, you come to The Wok And Barrel for what? Next door got Maxwell Market what. Makes more sense to go there instead right? I loved the texture of the pasta and the little meat chunks which I am guessing was char siew but I am sure I am wrong about this.So char siew, or sauce-coated sio bak? When it was first served, I was frowning at the portion. How come so giam siap one!! Then as it turned out, the portion was just right as the noodle dish has a tendency to get a bit jerlat (sp?) towards the end. OMG, the rendang is heavenly! I loved it. The rendang was very well cooked and it was clearly the star of the evening. It was tender, juicy and so soft that the meat disintegrates in your mouth when you only need to crush it with your tongue against the ceiling of your mouth. It was so good that I felt that the rest of the pizza was redundant. 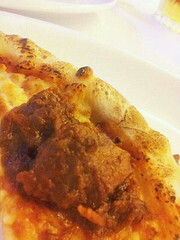 I found myself gobbling up the rendang and then wondered what to do with the rest of the pizza crust. The Margherita has always been my favourite as it is one of the rare pizzas that has something green on it and it isn't green bell pepper. I love my Margherita with general servings of fresh basil leaves. None of those nonsense McCormick-shredded-dried-basil-in-a-bottle type. 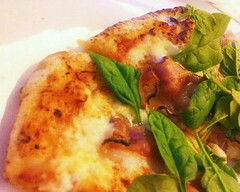 The Desiree Pizza uses baby spinach which was very tummy and bacon was the perfect complement to somethings that would otherwise be deemed too healthy. This was on the house, compliments of Shen. It's marscapone-based and so this is a banana tiramisu, if you can call it that. 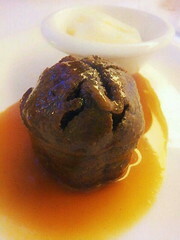 I am never a big fan of bananas but this particular desserts is pretty good that we devoured it nevertheless. I am going pause here for a short while to go on record that this is NOT an advertorial. Folks who are familiar with my blog knows that I keep this blog commercial-free. 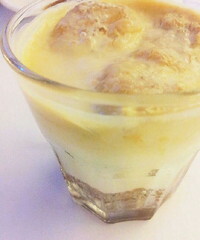 I am not THAT easily bribed with just a dessert lor..... please! A punny play on the name and an equally interesting interpretation of a very traditional local dessert. 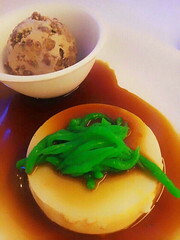 Red beans, milk, chendol green jelly worms and gula Melaka. The essential elements of the chendol. Shen throws in a slab of panna cotta and Bam! Shendol! I am a sucker for panna cotta especially one that is made from fresh goat's milk. I believed The Wok And Barrel played it safe using cow's milk instead as the "goat smell" needs an acquired taste. Still, it was my favourite dessert amongst the three orders. This is Jas' favourite amongst the three desserts. I haven't really tasted this as I was very stuffed with food by the time I got to this one. In all, we were happy with the meal and the price isn't expensive with the bill inclusive of drinks, coming up to about SGD 110.00. I like the view from the inside looking out onto the streets but not the other way round. I felt that when the restaurant is empty especially when it is before the meal crowd arrives, the whole place look pathetically lack of 人气. I would suggest adding a small partition (like a folding screen) breaking the line of sight from the outside to the back wall of the inside. Besides, the the black font on clear glass signage would have better visibility if we have a light-coloured opaque background partition. The place is not Halal. You may wanna take note of that. Oh yah hor. I got my clue from the fact that the establishment sells alcohol though. I know I am a bit late!! The pics are pretty awesome eh? Should feedback to Shen to lighten the flavor.. I can't imagine finishing a serving of that bak chor mee pasta.. Will puke. Haha. Thanks for the dinner again Lao Pa! Yeah, they are kinda heavy on the taste buds. Perhaps pairing it with beer is a necessity instead of an option?